Welcome to the Babylon Curtain Design! 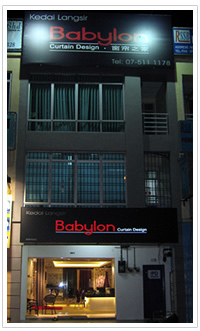 Manufacturer, supplier as well as retailer of window coverings and its components in Johor Bahru, Malaysia, Babylon Curtain Design is an established local family business that can offer an extensive range of attractive, practical and custom made to measure blinds as well as curtains. We also offer ready made blinds and curtain railings in various materials, sizes, designs and types. We are your one stop, window solution needs for every homes and leisure facilities to offices and commercial premises. Top quality craftsmanship, combined with stylish, practical designs that are specifically manufactured to be easily maintained, Babylon Curtain Design takes pride in offering made to measure vertical, roller, wooden venetian, roman blinds and curtains at competitive prices. Call us today to arrange a home visit around Taman Nusa Bestari area. We look forward to being of service to you and hope that if you have any questions, comments or suggestions or simply require a quotation that you do not hesitate to contact us.